The blurb: A reimagining of the classic horror tale about Carrie White, a shy girl outcast by her peers and sheltered by her deeply religious mother, who unleashes telekinetic terror on her small town after being pushed too far at her senior prom. What did I think?Carrie White is regarded as a loser, a loner, a social outcast. She is the daughter of an obsessively religious & overbearing mother. She also possesses the ability of telekinesis, and when Carrie gets upset or angry things around her tend to break, smash or get damaged, so when some vicious school bullies cross the line with their “fun”, Carrie can’t help but get a little angry. This causes Carrie to unleash her full fury at anyone who gets in her way. Filmmakers can obviously achieve a certain level of effects now that they couldn’t way back in 1976, and there are some pretty impressive effects here. It’s not an effects-laden extravaganza and quite rightly it shouldn’t be as Carrie is story-pushed and not effects-pushed, but some of the effects in the movie are well done and pretty cool to watch. Chloë Grace Moretz does a really good job of playing Carrie bringing her own believability to the character, and Julianne Moore performs equally as good as Margaret White, Carrie’s mother. The members who played the bullies – especially Portia Doubleday as Chris Hargensen – were also believable in their parts, and when it came to their time I had absolutely no sympathy. I cheered inside when they really got what they deserved. The blurb: A teenager teams up with the daughter of young adult horror author R. L. Stine after the writer’s imaginary demons are set free on the town of Madison, Delaware. What did I think?I loved reading the Goosebumps books when I was a kid and this film really reminded me of them – it had the same comical and familiar feel to it. It had a little something I wasn’t expecting and had been directed in a clever and funny way. Although it had monsters and other scary creatures in it, the movie plays this down to make it ideal for kids to watch while adding humour which kids would understand and laugh at. The acting was reasonable and Jack Black (R.L Stine) brought something else to the table, which for me made it more enjoyable with his usual goofy and wacky personality. The blurb:Four waves of increasingly deadly alien attacks have left most of Earth decimated. Cassie is on the run, desperately trying to save her younger brother. What did I think?Even though I’m reading the book and I pretty much knew what was going to happen the whole time, I couldn’t stop watching it or awing and gawking at the two hunks (Evan and Ben) who reminded me very much of Jacob and Edward from The Twilight Saga Film series. The lack of action in this movie is what made me rate the way that I did. Going into this movie you expect to see the 5 waves in full action, but instead they limit what they want you to see making it almost a downer. Instead this movie focuses mostly on Cassie and her long mile hike to this army base to rescue her brother from aliens, all the while running into different obstacles which eventually shape her into this strong, surviving, attractive young girl. Will I continue to watch this trilogy? Of course, in hopes of a little more action. But even with Hunger Games there was minimal action up until the end. Be prepared to run into clichés but also a simple satisfaction that at least there are other sequels that hopefully bring good recognition to the novel. The blurb:Sixteen-year-old Josie Ferguson has just lost both her parents. She is sent to live with an unknown aunt and uncle in a town on the stormy northwest coast of Scotland. But the townspeople, including her relatives, are as cold and hostile as the sea. Josie has never felt so alone. Then Eli appears. Mysterious but kind—and handsome—he sparks a desire in Josie unlike anything she has ever experienced. Even though she’s been warned that Eli is forbidden, she can’t stop thinking about him. And the locals are harboring a secret. When curious, determined Josie sets out to uncover it, the truth is more horrific than she could have imagined. It’s a truth terrible enough to raise the spirits of the dead. What did I think? 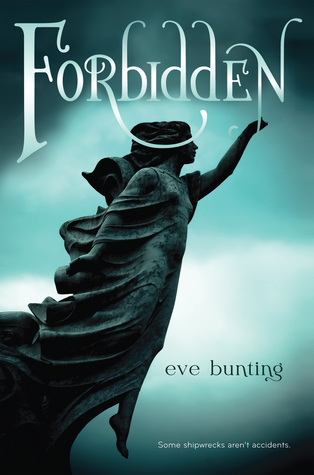 There are ideas in Eve Bunting’s “Forbidden” that I really liked. I selected it to read because it seemed the old fashioned ghostly romantic story where a young girl is sent off to a remote place to relatives she barely knows and there she meets a mysterious man. In this case, her name is Josie and the young man is Eli. The remote place is Brindle Point and the home is called Raven’s Roost. Bunting has a nice touch in the writing that it isn’t contemporary but it isn’t wholly historical either and it lends to the surrealism of the story. That said, the story didn’t completely work for me in the end. I’m not really sure if it was the characters, the pacing (it was slower than I expected), that it was too short or that it became too predictable but it lost steam for me just as it should have picked up. * Female. Seventeen. June 28th. Gemini. Londoner. College student. Future Sociocultural anthropologist. Gymnast. Swimmer. Cheerleader. Knitter. Baker.